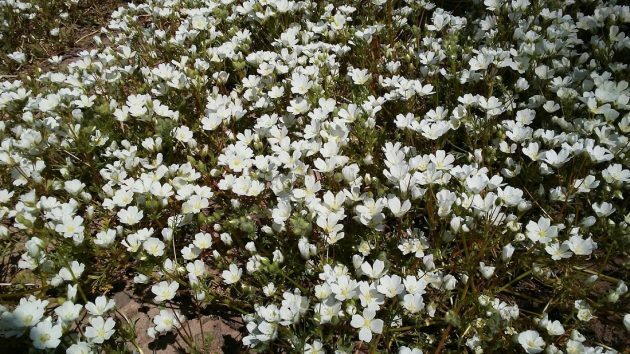 Hard not be be dazzled by this brilliant expanse of white flowers off Bryant Drive. One of the benefits of living in the Willamette Valley is the springtime splendor of farm fields all around us, like this field just outside of Albany, off Bryant Drive. The bike and I stopped on Monday for a couple of pictures. 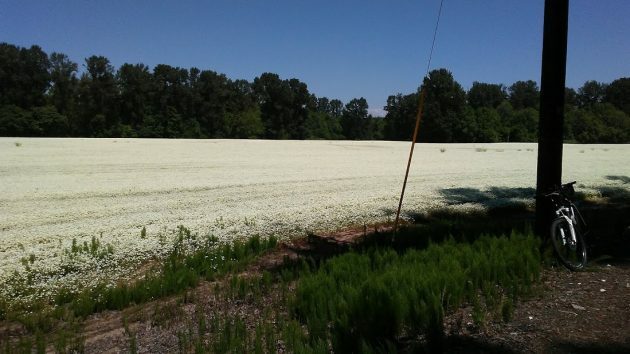 It’s a big field of meadowfoam, if I’m not mistaken. And a bit farther along the road, a dozen or more hives were set out so that the bees would have easy access to this seemingly endless supply of nectar. The hives belong to Old Blue Raw Honey, a small company based in Philomath. It’s an interesting operation, as I learned from its website. You can read all about it here. Honey derived from meadowfoam is said to have kind of a vanilla flavor. You can test it if you order some, which you can do on the same site. Back in the 1980s, or thereabouts, I remember meadowfoam being touted as a replacement crop for grass seed so that valley farmers would no longer have to do so much field burning after the harvest. It never caught on in a big way, and because of laws enacted 20 years ago, seasonal field burning has all but disappeared anyway. A closer look at the meadowfoam flowers. And finally, here’s a long shot without the distracting presence of my bike. Would like to purchase your honey. Are you at the Farmers Market? Yes, Old Blue Raw Honey is at the Corvallis Farmers’ Market on Saturdays. 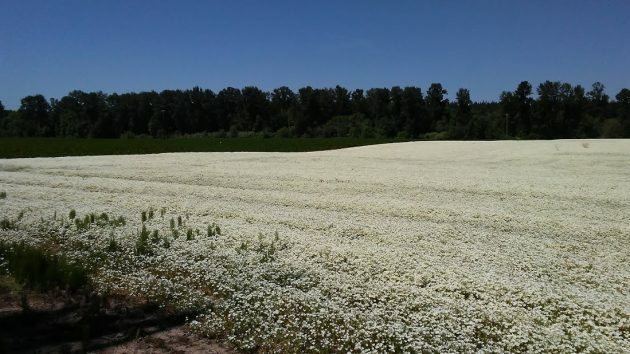 Our farm fields are beautiful for sure, and OSU researchers have just found that meadowfoam contains compounds that make for better sun screen and other skin care products. The true beauty of the valley is it’s penchant for propogating nearly anything with roots. In a single lifetime, we’ve shifted from grass field-burning to cannabis growing, proving once again – the alluvial plain we happen to occupy is magical, indeed! There is another large field to the west of Scenic Drive just south of Oak Grove Drive. To me it looks like a field of snow, until it nears harvest when it turns a drab brown – still a beautiful sight.